Seeking for a new career challenge, or having a beloved who needs intensive family care? We are happy to teach and share all the skills and the wisdom of KOHKI method. KOHKI method shines when it is served to, shared and exchanged with someone precious. It can work as a strong tie or safety net among your family. It also may create an exciting prospect of your new career as an independent healthcare professional. We are always passionate about teaching all the wisdom of Kohki Therapy, which covers knowledge of Eastern and Western medicine and more to pursue. Conducted in a relaxed, face to face setting, we offer a range of learning courses which are from basic to advanced, both practices and theories, and can be customised flexibly to suit your specific goals and needs. Self-care / Family-care course covers the basic knowledge for conducting D.I.Y self maintenance, exercise "Kohki", and simplified treatment methods beneficial to yourself and your family members. Do you have anyone beloved who needs health support in daily basis? You can make him/her feel better though Kohki's family-care method. That's actually not so difficult to do as it sounds to you. We believe that daily-basis healthcare by hands of partner or family members is much more effective in most cases than any other professional treatments performed by others only once in a while. If you are interested in learning effective modality to boost your therapeutic skill and or seeking for a new career, why not start with us the course of “Certificate of KOHKI Therapist”. This includes everything you need to kick-start your Moxa practitioner life: from skilfully handling Moxa and Kintsu, performing basic diagnosis, surface level of treatment improving total flow of energy (Nagashi), to providing deep tissue relaxation all with the great effect of heated herbal incenses. This certificate allows you to practice in public as a Kohki practitioner and participate in many treatment opportunities with us at famous music festivals, yoga and other healing events/expos. In the end, the Advanced Diploma of KOHKI Therapist can be acquired when you complete all units of our Professional Practice course, master all skills necessary to the treatments and succeed in passing several skill assessments. 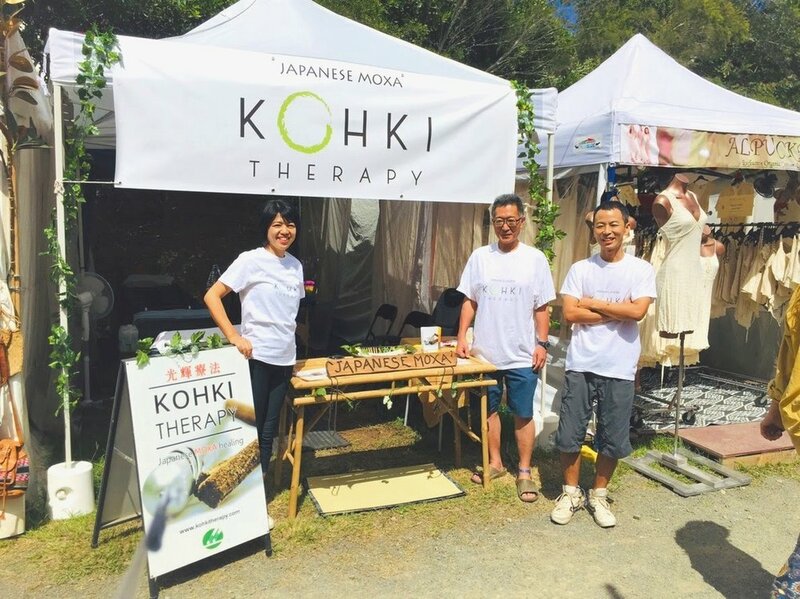 Then you will be one of us fully-accredited Kohki Therapists who devote their passion and energy into holding 1 on 1 therapeutic sessions and healing someone's sufferings in Kohki’s powerful but sophisticated style. This modality is a quite new thing to Western world and still not well-known to it, so we are very keen and eager to have more pioneers to work with us and participate in our project, so that we will spread this method, expand its population and make a greater and explosive development in the near future. For those who have completed the courses above, quest for more highly levels including special retreat session with Great Masters in Japan.